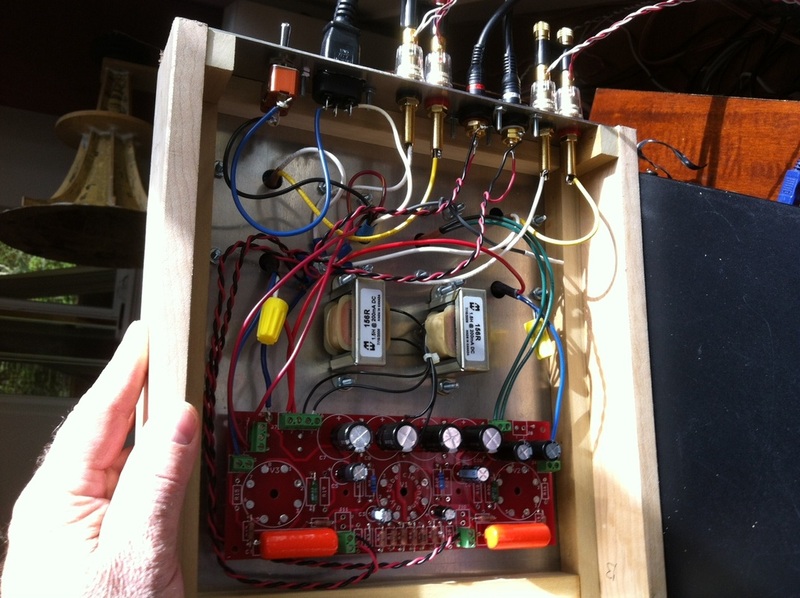 Tube Audio: Oh my Darling Clementine! The other day, Spencer, an acquaintance of mine dropped by for a listening session. 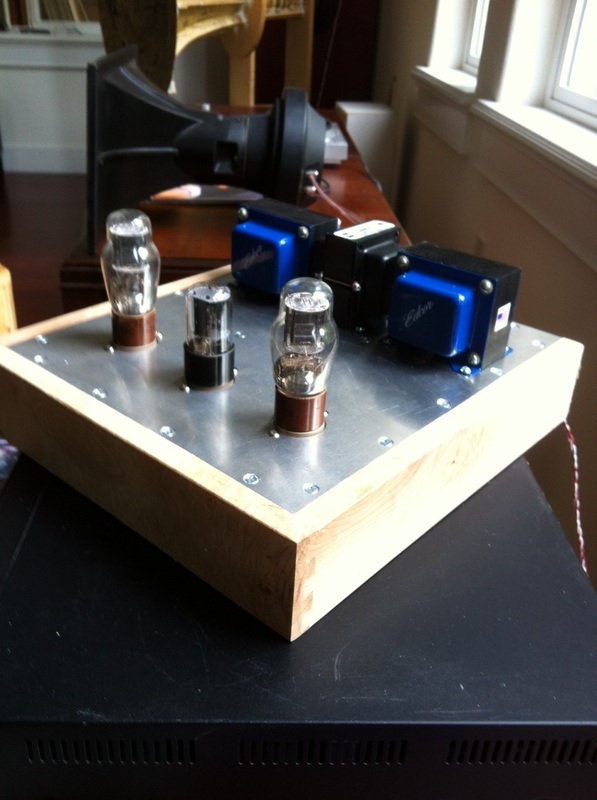 As prearranged, he brought a tube audio power amp (stereo version). I didn't know what to expect, but was excited to hear how it would perform with my paper horns. Let's say, I wasn't disappointed. Spencer's amp is a Primaluna Prologue 2, and although I know very little about its features, that's not nearly as important as the impact it had on me. It felt like someone had lit a small flame in the back of my mind and just put me on "simmer". I remember reading years ago about a well received, little 3/4 watt amp called the "Darling" designed by a creative fellow, Bob Danielak. I did a search on the Internet and found the original article--worn around the edges possibly due to formatting issues, but intact none the less. 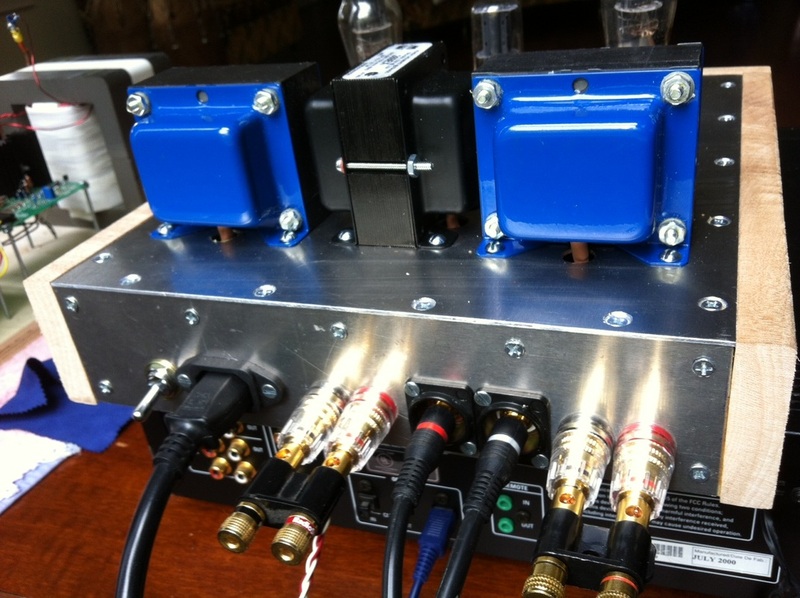 A clever thought turned up the flame: A 3/4 watt amp should easily drive my 110db, 1w1m paper horns. My mental juices were aglow (pun intended) with a new adventure! I put the article away and continued my journey through the "net" hoping to discover whether or not the design had been improved. Low and behold, I came across a lovely forum called DIY Tube (you can locate it at www.diytube.com) which not only offered additional information regarding the Darling (they call their version the Clementine), but had refined it into various renditions. My particular quest involved locating the 1626 output tube version. It's supposed to have that 2A3/300B sound, but in a much smaller (affordable) tube. Smaller tube, smaller price, and this is where my interest piqued: In this economy, I don't want to spend a fortune on something that breaks the bank, or if not assembled with a brain surgeon's precision, sounds like ball bearings in a blender. The owner of the forum (Shannon Parks) not only keeps the Darling alive, but offers stereo version pcbs! It didn't take long to find his order page, lay out $41.75, (which includes shipping) and get one headed my way. 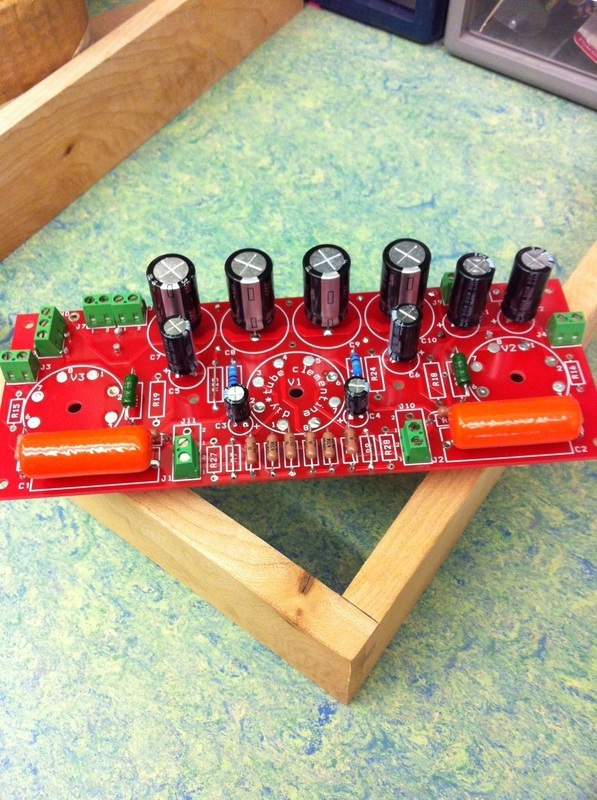 The pic, below, belongs to Shannon Parks, and displays the symmetrical beauty of his pcb design. Here's the schematic as drawn by Shannon Parks. Click to enlarge. Here's the CLCLC power supply. I added an extra 1.5 H choke (where R21 normally goes) to gain a bit more filtering. Seriously, I haven't felt this excited about an amp in years. It felt like a scavenger hunt: everything's out there, you just have to go online and find its location. Here's a picture of the 1626 tube. It's about 1/3 the size of a 300B and about 1/10th the cost. I spent $22.00 for a pair. 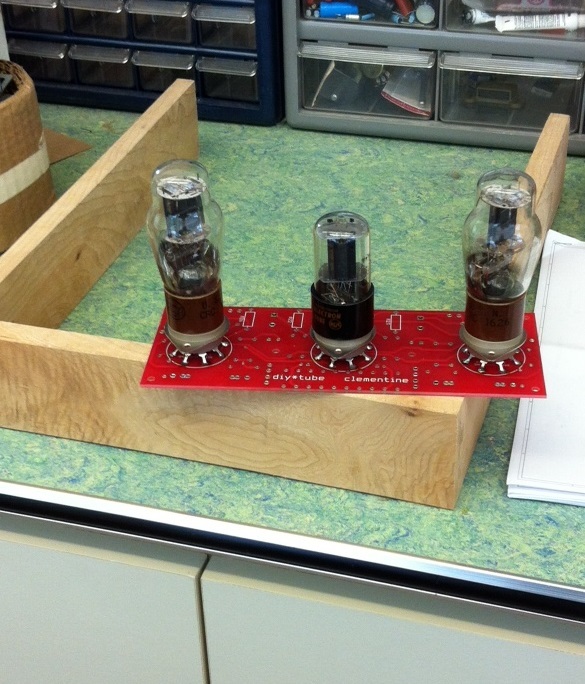 Here's the first stage tube. 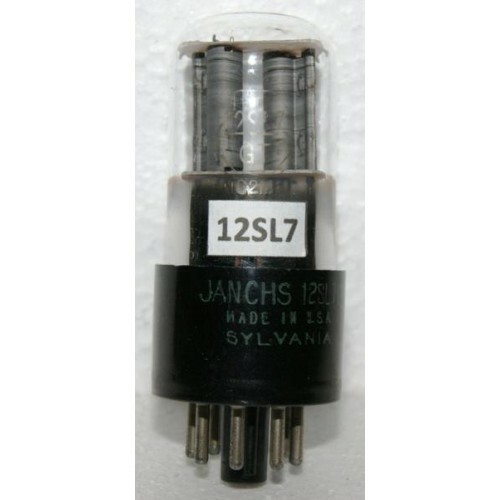 At $6.00, the 12SL7 is extremely affordable. It's a dual output device and you only need one for a stereo amp. Hammond manufactures the power transformer which retails for about $47.00. It's a tiny little thing, not what I'm used to. Edcor manufactures some of the most beautiful output transformers, and the bang for the buck is fantastic! I ordered a pair for $74.00. I shelled out another $80.00, or so, in misc. parts and shipping--you know, resistors, caps, terminal blocks, etc. 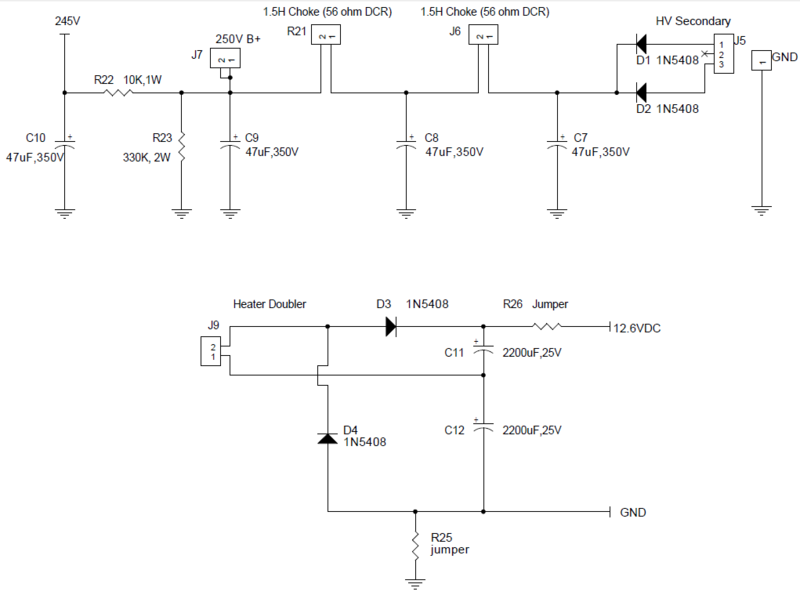 As you can see, with just a bit of math, this project (under $300.00) is extremely affordable. Below, you can see where I'm at: The sockets are soldered into the pcb, and the tubes have been placed for this shoot. I had to spread the pin holders in the sockets with a small screwdriver--they were so tight the tube couldn't be inserted. You'll also notice I've started the chassis (with dovetail joints, I might add). My plan is to create an aluminum top and then cap that with a piece of granite, or marble. It should look amazing. More parts arrived, today, and now the pcb is populated. When the output transformers arrive, I can hook everything up and listen to this little honey. The completed project (minus stain/lacquer). So simple: I placed everything in the chassis, while following written directions provided by Shannon Parks. I didn't even bother to fire it up through the variac. I just knew it was going to work. Of course, I tested it on some cheapo speakers before bringing it to its new home. You'll notice I use the traditional "star ground" scheme. I also twisted the input wires to reduce hum. I will eventually place heat shrink onto the wires with the yellow wire nuts, thereby removing that little eyesore. 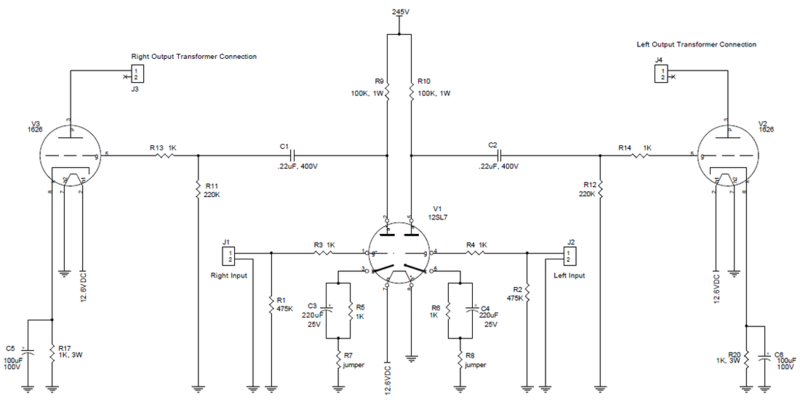 The power supply is a CLCLC configuration--the helps reduce hum too. It now becomes "the" high frequency amp in a tri-amped system. Observation 1: My 110db 1w1m horns are extremely quiet when I turn on the power. This is stunning considering this is a single ended tube amp. I expected noise/hum..... if I place my ears into the horn I can hear just a faint, telltale wisp of hum--move back fifteen feet to the sitting area and it's dead quiet. Observation 2: Let me tell you what, this little 3/4 watt amp is a beast when coupled with my paper horns! It can get loud , and without much distortion. This reveals two thing: 1. horns are amazingly efficient when coupled to a JBL 2446 compression driver! 2. They had it figured out in the 50s. It's almost a shame they discovered the transistor. Today, I've become a true glass audio convert. Observation 3: My first thought, even though I haven't given the amp time to warm up, is that the sonics are detailed and engaging. It's a little bit laid back, compared to the solid state, class A critter featured elsewhere on this site. Guess what? It doesn't matter. The Clementine is my new darling and it's here to stay. Observation 4: After several hours of "breaking in", my wife and I notice the sound has gained weight/body and mellowed. This must be that "lush" class A tube sound that everybody writes about. Observation 5: This amp MUST have a half hour of warm up before listening to music--it sounds sterile, brittle if you don't. After the warm-up, you can hear it gradually transitioning, and I fall into that "I can't bear to stop listening" mode. It's really magical. I've never experienced anything like this in my life. After an hour, the amp is making love to your ears... seriously though, the lush warmth is reminiscent of my lover's lips whispering "I want to be with you forever" as she kisses my neck. I'm absolutely crazy in love with this sweet little creation. I spent several evening listening to every genera of music. Everything sounds new and original. I heard the Doors "Riders on the Storm", the Moody Blues "Days of Future Past", the Eurythmics "We Too Are One", Willie Nelson's "Greatest Hits".... WOW, it's all sooooo good! The best part: there's a lot more listening sessions to come. That belief has been buried with the creation of this "Darling" amp. Solid state truly pales in comparison. The dynamics, transparency, intimacy of glass audio is practically beyond description. I'll never go back to solid state. Anybody want to share ideas?